My pal Richard and I haven't fished together for ages. so when he rang the other day and asked me if I fancied an hour on the river I was keen to give it a go. 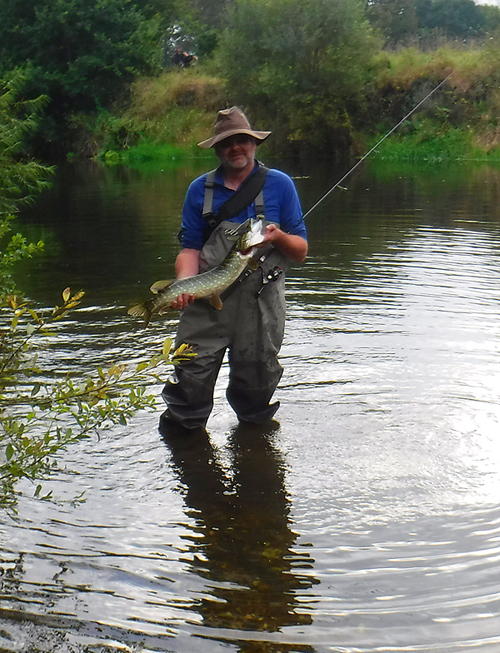 We met in the little car park and after setting up the spinning gear we walked upstream to a wide, shallow spot which, at times, produces a variety of fish. As we paddled into the water we could see thousands of big minnows and here and there shoals of dace and roach - all good predator food. In fact the fishing was a bit disappointing. 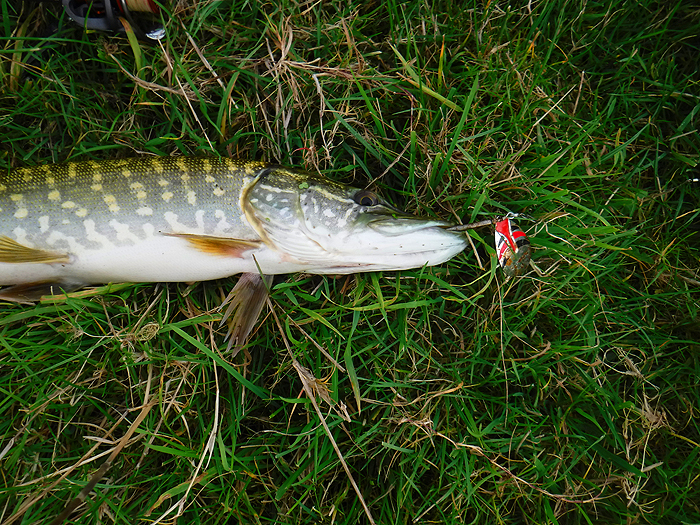 It took quite a while for the first bite which was a jack pike on Richard's plug. I was just getting the camera out of the bag when the fish came unstuck. We pressed on and then simultaneously we hooked pike. Richards was the largest and this time I managed to get pictures of both fish. After one more jack for my pal we decided that it was time to go and we walked back downstream for a final dabble in the fast water downstream of a weir. This time Richard fished one end of the race and I waded across the apron to the other side. 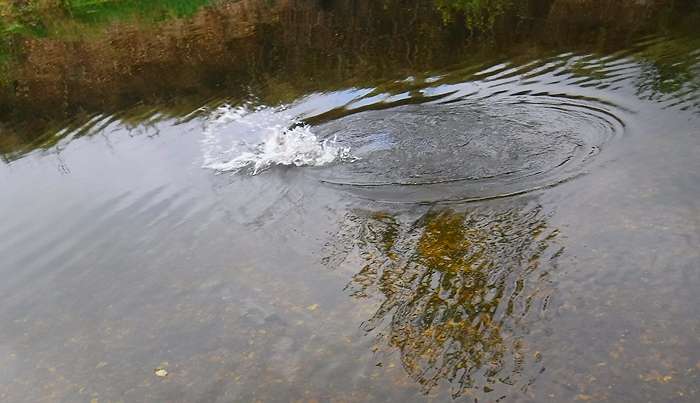 I'd only got about half way across when I heard a call and looked round to see a big trout hurl itself into the air on Richard's line. The fish splashed and jumped in a spectacular fashion but again, as I extracted the camera from my bag, it escaped. Still, an interesting evening. 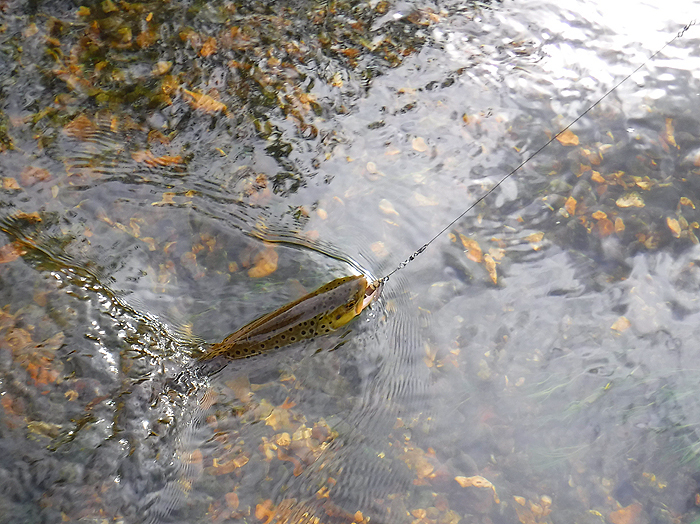 On a short visit to the spot a couple of days earlier I'd had three trout but none were anywhere near as large as the one that got away. My next spinning session was to the same river but on a stretch a couple of miles downstream. 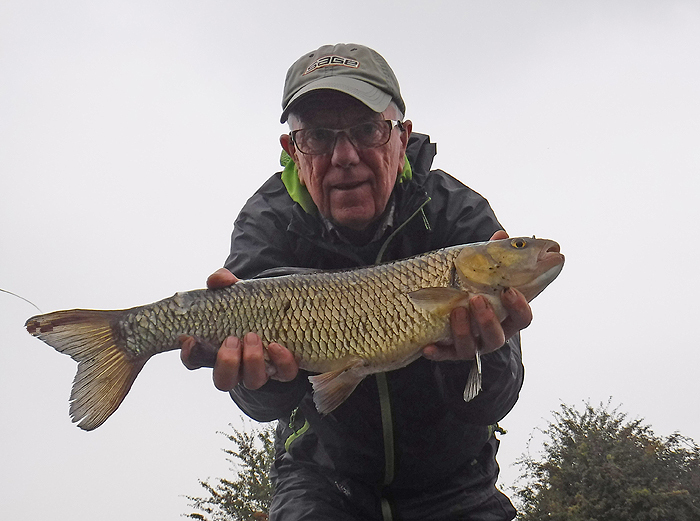 This time I used a J9 Rapala and since there was no wind at, all using my little Teklon rod was able to cast it a long way downstream. 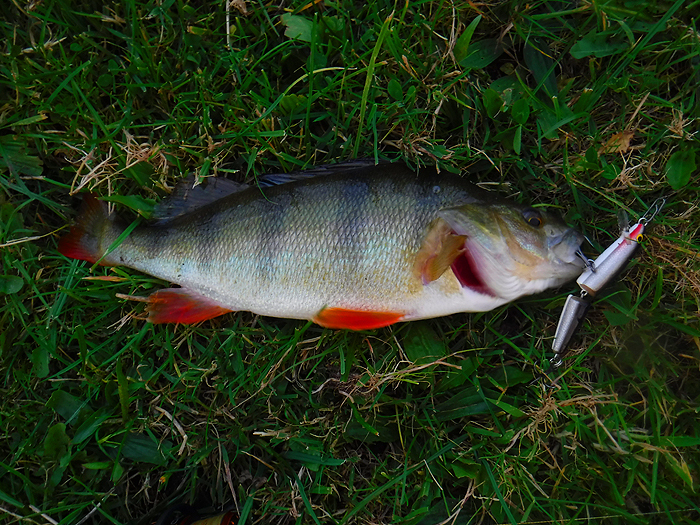 The first fish to take was a decent perch, a good start. After that it was slow and for three-quarters-of-an-hour I didn't have a sniff. I came to the deepest, slowest stretch on the section and as usual, cast down and across to the far bank. 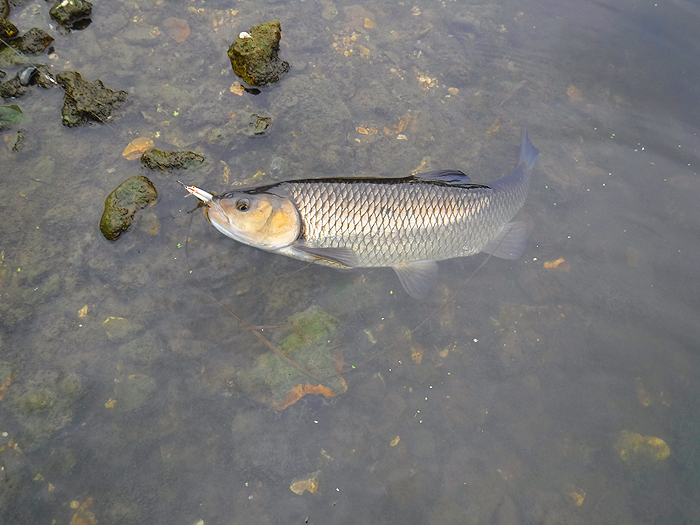 About half way back the lure stopped, the rod bent, the reel buzzed and my first thought was 'jack pike' but then I saw the silver flank and rounded dorsal fin of a big chub. Excellent! A little further downstream I had another perch and for the walk back up I switched to a big spinner but it only produced a small pike. All good fun though. 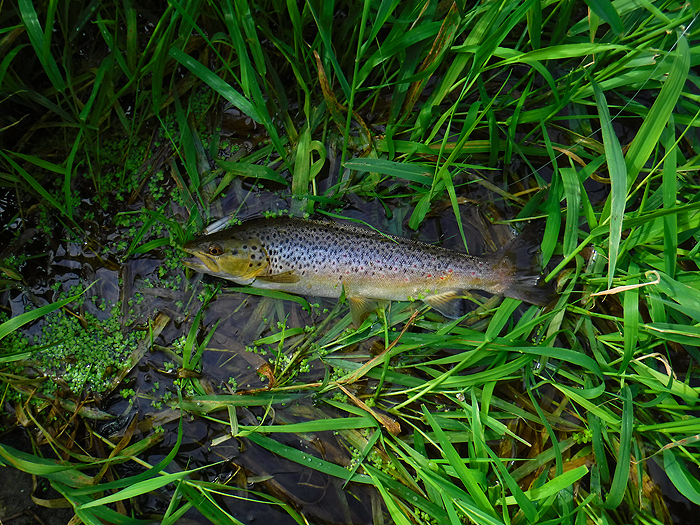 Small trout on a Rapala. Bigger trout - same lure. My little pike fought like stink. Richard's pike was a reasonable size. My small fish well beaten. Nice chub on the Rapala. Five pounds plus so excellent. 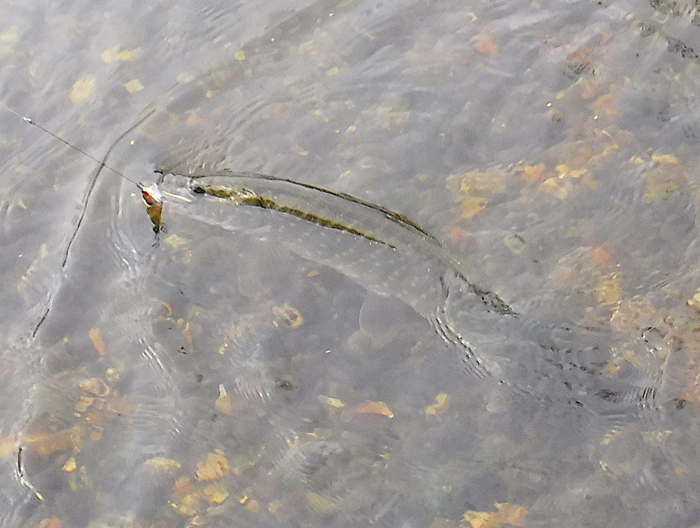 A pike to finish with - that's why I use a wire trace.